Â The Institute of Museum and Library Services recently announced that the Media MashUp project will receive funding. To investigate and develop best practices around public library implementation of innovative technology programs. Starting in November 2008, staff from Hennepin County Library and partner libraries (Public Library of Charlotte & Meckelenburg County, Free Library of Philadelphia, Seattle Public Library, Memphis Public Library and Wilmette (IL) Public Library) will learn how to use Scratch software; a game design and animation program. Lead training, implementation and evaluation partners are the Science Museum of Minnesota and the Institute for Learning Innovation. The second phase will involve libraries implementing their training into workshops for their patrons and to evaluate the literacy aspect of the programs. Reports and evaluation will be developed in the final phase. For questions or more information, contact Jennifer Nelson at (jrnelson@hclib.org). My husband has played guitar –for fun, not profit–since he was around twelve. He knows how to read music, has played in informal bands, and could care less about being a Guitar Hero; rhythm games just aren’t his thing. In fact, he plays along on his REAL guitar while I strum hopelessly to “I Love Rock N Roll” (he might be mocking me). While we were browsing at various instrument shops over the long weekend (Daddy’s Junky Music, and then at Guitar Center) I noticed two how-to play books by Hal Leonard, based on popular rhythm games, and thought, wow, a library that added these to the collection might be pretty cool. The Guitar Hero Song Book came out last year. It contains notes and tablature from forty songs featured in GHI & II, most for more advanced players, with a strong focus on heavy metal songs. 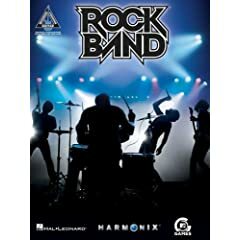 Rock Band: Songs from MTV’s Video Game contains the guitar tablature from twenty-five hits. Most of the Hal Leonard books cost around $20. I’ve heard lots of teens say at gaming programs that Guitar Hero inspires them to learn to play guitar, and I’ve heard from librarians that say while they don’t want to do a bait & switch (come in for the games, leave with the books), they are not adverse to softcover titles with relevance, i.e. books on how to play guitar at a Guitar Hero program. So, keep Hal Leonard titles in mind, especially if your library’s fiscal year is coming to a close and you have a little money to spend before June 30.